With San Diego Comic Con just a week away, the awesome reporters at Entertainment Weekly have decided to give us a first look BEFORE the first looks. There’s a bunch of stories in this week’s issue; but there is one that stands out above the rest – and on the cover – Avengers 2: Age of Ultron. So what did EW manage to bring us about the film? A lot! So much in fact that I’ve divided the coverage of this article into two articles just because there is so much to break down! So if you want to hear about Ultron’s origin story in full and how the entirety of Marvel’s Phase Two was leading up to this moment, go on over and read my Complete Story of Ultron’s Origin. As for this article, I will be detailing everything else in this film: plot set up, Scarlet Witch, Quicksilver, and the mysterious synthoid named Vision. So let’s get right into it! During the post credits of Captain America 2: The Winter Soldier we saw Baron Von Strucker with countless artifacts and two super powered prisoners. This scene will play into the opening moments of Avengers 2 when we find our heroes already assembled and kicking some but. I’m still waiting to see who gets to say “Avengers, Assemble” first; but there is much more to this scene than just some possible battle cries. According to some leaked footage reveals, this base is filled with goodies from past films, including the body of one of the Leviathans that attacked New York with the Chitauri. It is this victory that the Avengers go on to celebrate soon after in the newly repurposed Stark Tower – now called Avengers Tower. The last time we saw Avengers Tower was in Captain America 2: The Winter Soldier during the targeting sequence of Project Insight. With the building having been fixed since the events of The Avengers – and leaving the sole remaining ‘A’ up top – we find a new headquarters for the Avengers that has all the look and feel of a S.H.I.E.L.D. base, but with just a little more … Tony in it. With loading docks for the new Quinjets, and an upstairs laboratory for Stark and Banner to work in, this headquarters is all set to save the world – and show off. As I just mentioned Stark and the other Avengers decide to celebrate their victory over Von Strucker by throwing a lavish party for government officials and other important people to show that they have a handle on world peace. In the wake of S.H.I.E.L.D.’s destruction, this party is paramount in showing that the Avengers aren’t just some uncontrollable heroes. They have a strategy and are organized. This can work! Though sadly after the celebrations are over, this is when Ultron makes his first appearance and attempts to destroy our heroes. Everyone has his or her moments of bad timing; but the times are about to get worse. One of the most exciting new characters added to this movie is the synthetic humanoid know as Vision. As a key member of the Avengers – and instrumental in the Ultron story – it was only a matter of time before Vision joined the team. At first many people though Agent Phil Coulson would be revived as Vision; but then that theory went south fast when he was revived for Marvel’s Agents of S.H.I.E.L.D. New theories of Vision’s origins began circulating when it was revealed that Paul Bettany was cast to play the servant of Ultron turned hero. So what’s so special about Paul Bettany? Well, Bettany has been working with Marvel Studios for years – or at least his voice has. Bettany is the voice of Tony Stark’s artificial intelligence named J.A.R.V.I.S. ; and if you think this new casting isn’t just a coincidence, Joss Whedon assures us it’s not. Now Whedon wouldn’t go into any more details because that would enter the range of spoilers; but it’s reasonable to suspect that J.A.R.V.I.S. gets taken over by Ultron and is given a synthetic humanoid form. After all, Ultron at his very core is a program as well. So if you have a daddy issue infused robot with a messiah complex, it’s not hard to imagine he’d want to give life to Tony’s other program – who would basically be like Ultron’s brother. Marvel hasn’t released any images of Vision yet; but Entertainment Weekly saw some test footage and have revealed that his face is a bit more on the purple side than the bright orange. Overall, Vision appears “a bit more Borg and a little less Crayola.” Appearances aside, it is Vision’s allegiance that is most questioned. The EW articles right now place him as a villain on Team Ultron – along with Quicksilver and Scarlet Witch – but it’s not impossible for him to become good. In fact, I’m certain he will turn good. Vision might have been created by Ultron – which usually puts him at odds with the Avengers initially – but much like his creator, Vision will start thinking for himself soon. Though not everyone on Team Ultron will make the change from bad to good so easily. As if synthetic robots with incredible intelligence and self improving/replicating abilities wasn’t enough for our heroes, Avengers 2: Age of Ultron introduces our heroes to a new class of super powers. Before this film everyone’s powers basically resorted to being able to hit stuff, though we got some small forays into mind control with Loki in The Avengers and healing with the EXTREMIS Soldiers in Ironman 3. The powers of Quicksilver and Scarlet Witch don’t only improve upon those; but also shatter all preconceived notions of what is possible. In The Avengers, we knew Loki could control people’s minds when he touched their heart with his ‘glow stick of destiny’. In Marvel’s Agents of S.H.I.E.L.D. we learned that S.H.I.E.L.D. had been searching for possible telepaths, but discovered that it was basically a pipe dream since everyone suspecting was either faking or showed far too unsubstantiated reports. Scarlet Witch not only possesses these two abilities; but also removes all limitations set upon them. Imagine a character that can get inside your head from far away. Imagine a character who can harness magic and control people and objects without even needing to touch them. That character is Scarlet Witch and she is so powerful that the Avengers right now wouldn’t even believe someone like her could exist; but she isn’t the only one. Her twin brother Maximoff has completely new powers that the Avengers haven’t even gotten a taste of yet – super speed. We’ve yet to learn how exactly their powers came about; but from the last time we saw them they were with Braon Von Strucker of Hydra. Whether their with Hydra or Ultron, there is one thing for certain from the start: they HATE the Avengers. What exactly causes the twins to hate the Avengers is unknown at this time. Perhaps it was caused by teir time with Hydra or maybe the battle of New York had something to do with it. Though another option is maybe the twins resent the Avengers because they never did anything for them and their hard life. 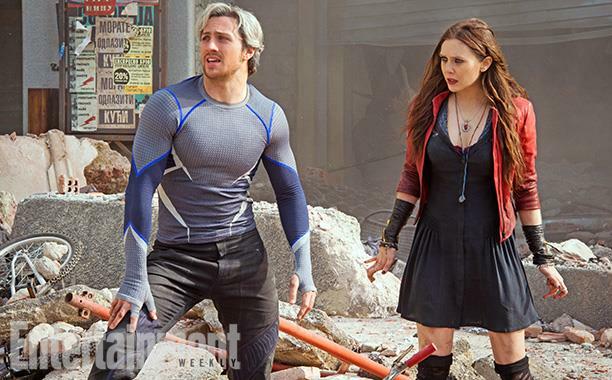 Maximoff and his sister have been described as a very close pair – sometimes uncomfortably so. In all honesty, they are all each other have and sometimes they must act like mother and father for each other. The thing to remember most about the Twins is that they’ve been alone and had to look after each other for basically their entire lives. At the end of the day, Quicksilver just wants to make sure his sister is safe and that anyone who tries to use her will pay. The last time we saw Aaron Taylor-Johnson and Elizabeth Olsen on screen together was earlier this summer in the highly successful remake for Godzilla. So between playing a married couple one year and siblings the next, I’m sure these two will be able to do justice to Quicksilver and Scarlet Witch’s complex – and sometimes awkward – relationship. One of the biggest hassles of shooting Avengers 2: Age of Ultron had to be Scarlett Johansson’s pregnancy. 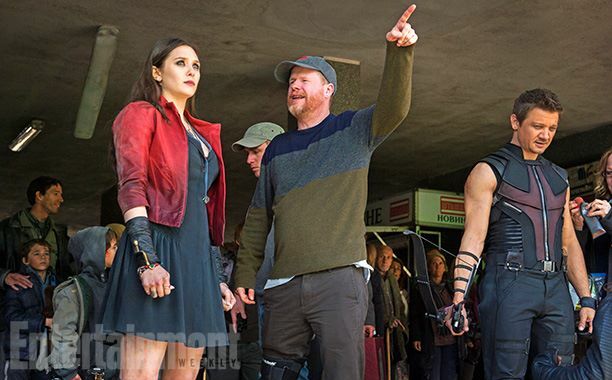 With multiple stunt doubles and flowing gowns, Whedon assures us that he’s got this covered. 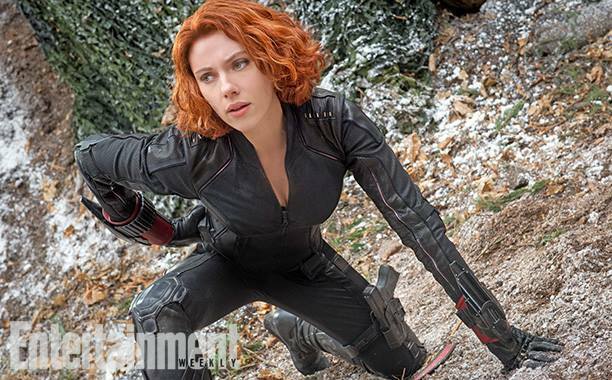 Although that isn’t the only drama Black Widow’s character might be facing. It’s been hinted that she and the Hulk might have a relationship in this film; but what about Hawkeye? In the opening party theme, Hawkeye is apparently off by himself in the corner. 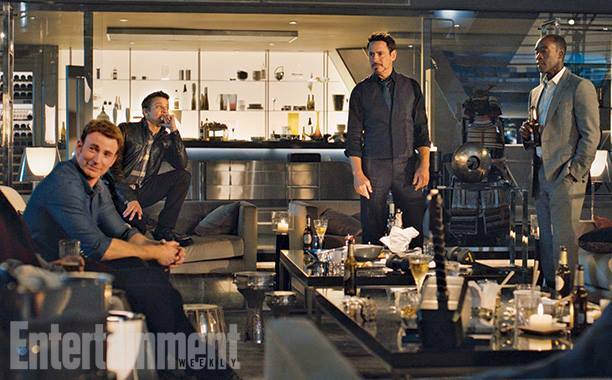 Could this be the usual lone wolf Hawkeye or is there some drama between him and Widow. One thing noticeably missing from Captain America 2: The Winter Soldier was Hawkeye. Where was he when all of this was happening? Perhaps Black Widow is upset about his absence from those dire circumstances? Either way, Hawkeye’s prior absence will be discussed in this film. There was so much revealed by Entertainment Weekly that it wasn’t fair to squeeze Ultron into everything in this article. So to read about his origins and how they fit into the Phase Two of the Marvel Cinematic Universe, check out my Complete Story of Ultron’s Origin. Though no matter how much we learned from this reveal, there’s still more to learn and see from the upcoming San Diego Comic Con – and still more to be filmed. So stay tuned for more updates on the biggest Marvel movie yet! 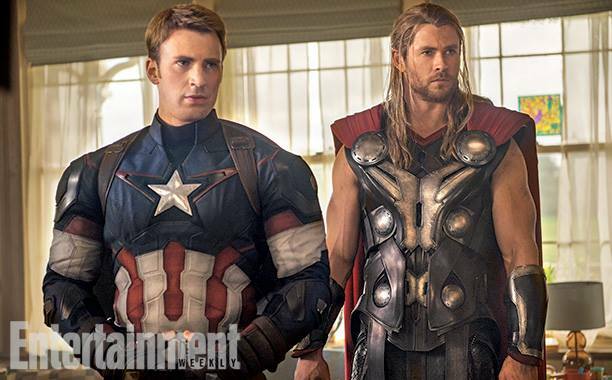 I spy Nick Fury’s outfit, so at least we have confirmation on that front. Update: For a detailed analysis of the Official Teaser Trailer, please read Avengers: Age of Ultron Teaser Trailer Analyzed – Fallen Heroes, New Faces & More.